Security Force Monitor supports human rights researchers, litigators and investigative journalists working to make state security forces more accountable. We are a non-profit research group that analyzes thousands of public records to create a simple searchable database of the commanders and the command structures, locations, and areas of operations of security force units and investigate their potential connections to alleged human rights violations. We conduct open source research and publish detailed information about the command structures of the police, military and other branches of state controlled security forces around the world. We provide research, technical and data analysis support to human rights researchers, litigators and investigative journalists. 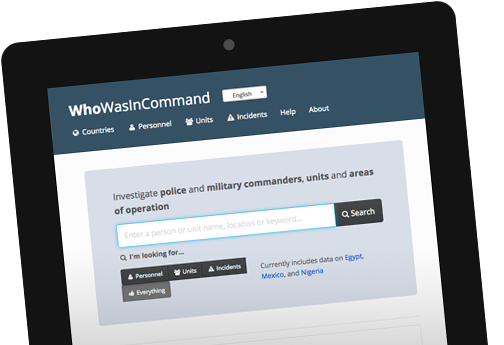 WhoWasInCommand.com is our free to use, public database of security force units and organizational structures, command personnel and areas of operation. Answering the question “who was where when?” is central for investigations into allegations of human rights abuse(s). Because of this perhaps one of the most defining, and complicaticating, features of the Security Force Monitor’s data is that almost everything we research is connected to time. Here's how to see all the sources our researchers used to evidence every single piece of data on WhoWasInCommand.